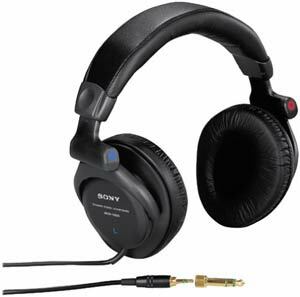 Sony MDR-V600 headphonesSony's MDR-V600 Studio Monitor Series Stereo Headphones are engineered to perform in high end audio applications. The wide frequency response from 5Hz down to 30Khz means that you have a spectrum large enough to do an initial mix down or sequence during the night without disturbing anyone. Sony's experience with headphones means that the driver unit is designed to be good to your ears. As long as you keep the noise level to low volumes that is. Listening to very loud headphones can cause hearing problems so do be careful.